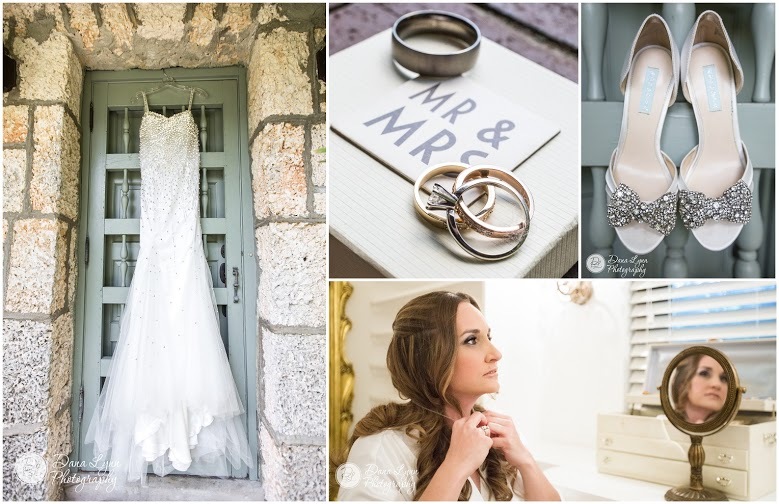 The story of our wedding: I’ve often heard people say that their wedding day was the “best day of their life.” It wasn’t until my wedding day at the Cooper Estate, that I understood just what they meant. From the moment I stepped out of my car and onto the property, butterflies and pure excitement jolted throughout my entire body. I felt like I was in a movie, the most perfect dream I could have ever dreamt. 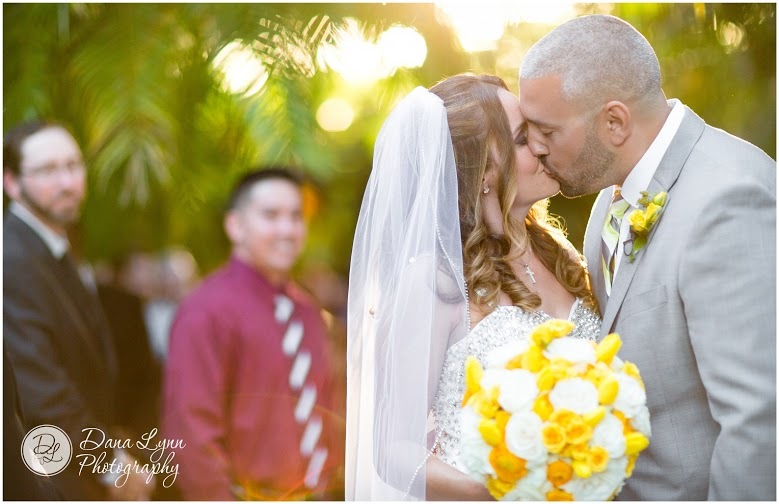 The lush trees were swaying with their leaves lightly rustling in the air as oodles of people calmly ran around working diligently to make my perfect day a reality. I couldn’t believe this was all for me. It’s like your birthday party day when you were little, but 1,000 times better. As I walked around in what felt like a utopian daze, I did my best to take it all in. From greeting my florist friends at Trias Flowers & Gifts to going over last minute details with the fabulous wedding planning, Donna Ingram, to sipping pink champagne while I sat getting my hair and makeup done surrounded by some of my favorite women, I was just so happy. I felt like a queen except for the fact that I was sporting the goofiest smile on the planet that I couldn’t seem to get control of. The ceremony was very special to us. A family friend, who is also a pastor married Anthony and I. He said things that we will take with us throughout our entire lives. 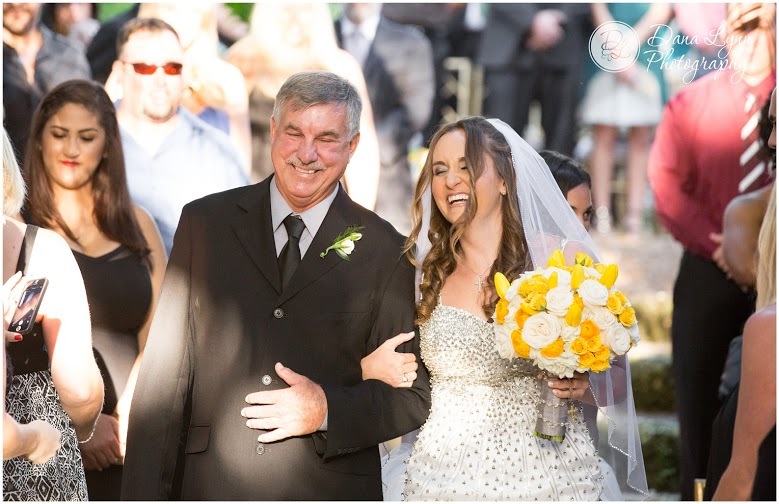 Between his loving words and the romantic environment, one of my uncles, who is known for his joking yet quiet demeanor, took us all by surprise when he took his wife’s hand and said that our ceremony made him want to renew his vows with her after 40-something years of marriage. We also later learned that one of our friends had to walk his two-year-old daughter away from the ceremony because she kept yelling out, “Misty princess!” The setting at the Cooper Estate had everyone feeling the love! Our whimsical ceremony turned into a mega-party at the reception. Between comical toasts that I think actually launched my best friend Delvin’s entertainment career, to an amazing menu that included a strawberry salad that our guests our still raving about, and that delectable Ana Paz cake, the party was just getting started! To my surprise, and to the surprise of my family, I didn’t shed one tear that day. I got “misty” eyed a few times (no pun intended) but all I could do was smile and try to take in every moment. When it was time to let loose, I had one special request and DJ Hurricane Rey made it happen! Delvin is a line-dancing instructor and so they coordinated a couple of songs so he could teach all of our guests a couple of dances. That really got everyone in the celebratory mood! Our guests loved dancing the night away while others enjoyed relaxing by the fire pit, and most everyone had a ball with the photo booth. At the end of the night, we were treated to a stunning sparkler send off that I had been dreaming of since I started planning our wedding. 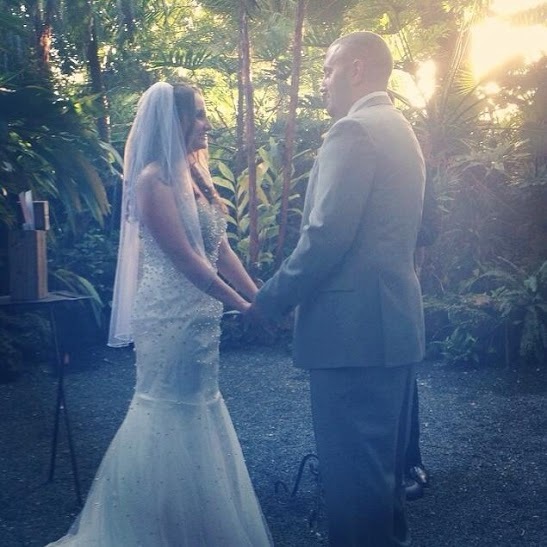 I just had too much fun at our wedding! It went by so fast that I swear the whole thing only lasted 29 minutes. 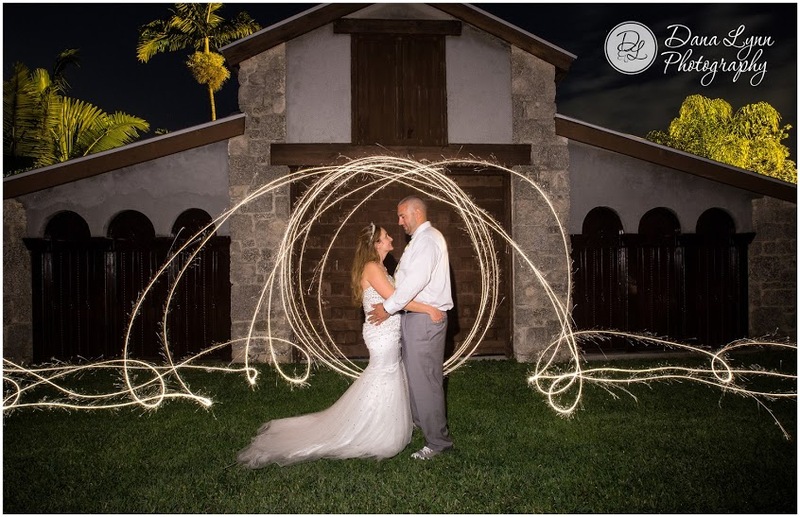 Our guests must have also had a blast because a month later people are still calling to tell us that it was the best wedding they’ve ever been to. This was a wedding for the books! Mission accomplished. For the most part, I planned the entire wedding myself. 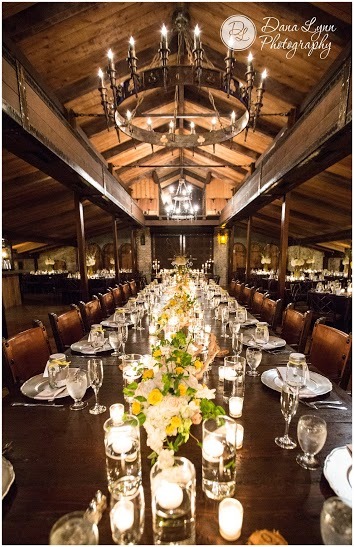 I was very adamant about taking such a gorgeous venue and making it ours with personal details. I own a public relations company and am familiar with event planning so I just put my creativity to work. 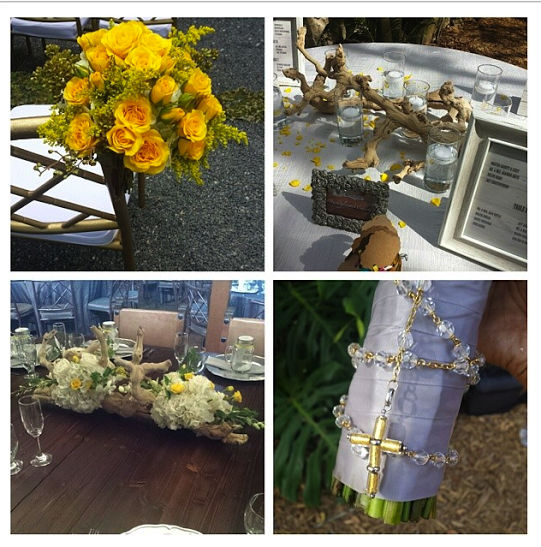 The colors were yellow, white and grey and if we had to describe the theme, it would be contemporary rustic. My flowers included roses, orchids, and hydrangea among others. 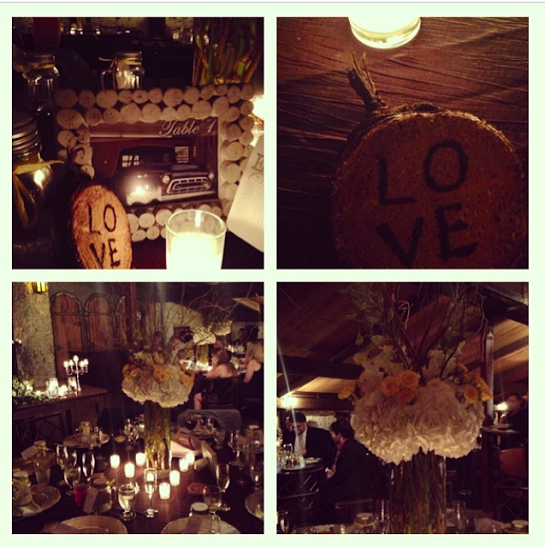 My table centerpieces were tall in clear cylinder vases and featured curly willow. The royal table centerpieces were clusters of flowers carefully arranged on grapewood branches that spanned the length of the table. 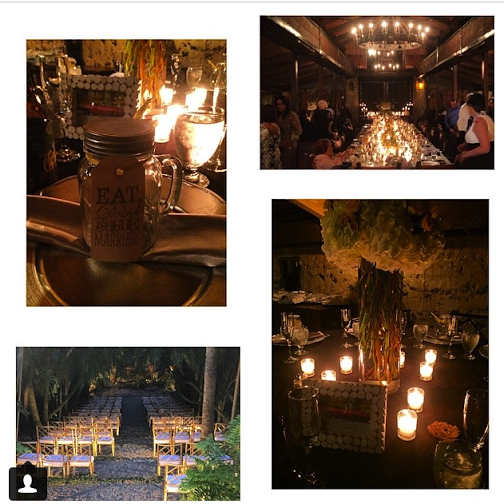 Of course, we had candles galore including floating candles in clear cylinder vases and votive candles in clear vases. 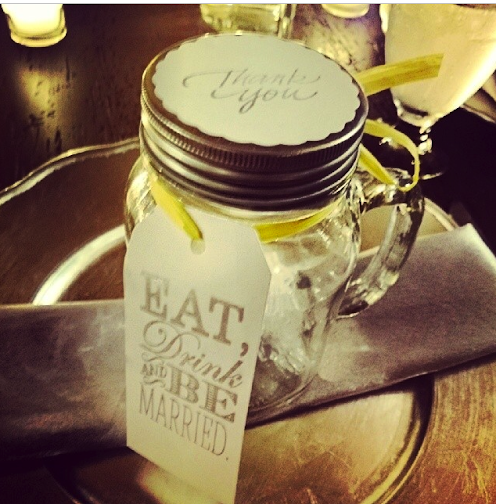 Our favors were mason jars that I custom-decorated with stamped tags that said, “eat drink and be married,” and a stamped “thank you” sticker on the top. Of course I had to add some sparkle, so the bottom of each mason jar was adorned in crystals of various sizes. My husband is a mechanic so I wanted to incorporate his love for cars into the wedding as well. Each table number was a frame with a different classic car. 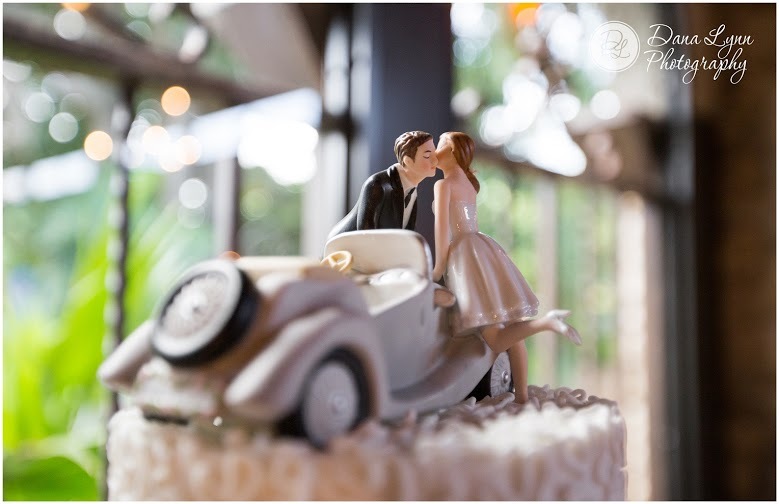 Even our cake topper was a bride and groom sharing a kiss over a car. In addition, I took tree bottoms cut off of Christmas trees and used a woodcarving tool to write messages on them. These were displayed along with the candles around the reception room. Continuing with the arts and crafts, my husband hand-made our card gift box to give it rustic and personal look. We also had a wooden crate that displayed our first initials in wooden block letters as well as a white palette board with antique keys that people were asked to write wedding wishes on.